Coverage of the entire field of information and telecommunications, with special emphasis on educational research in its application. 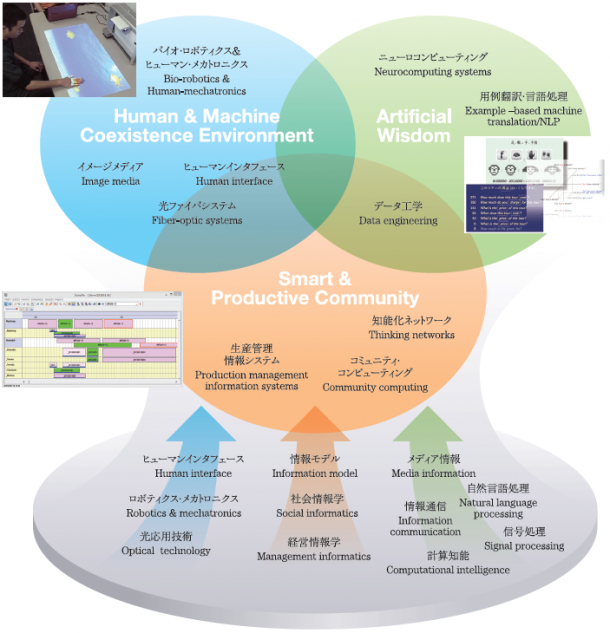 Development of applications and networks requiring state-of-the-art theory and academic-industrial cooperation. Education that accommodates those transferring from outside the fields of science and technology, and that supports the development of a wide range of careers. Safe and secure society and comfortable environment comprised of human, information and things. The information architecture ﬁeld is tackling research on information and system technologies in wide spectrum and its application, which support upcoming smart society. 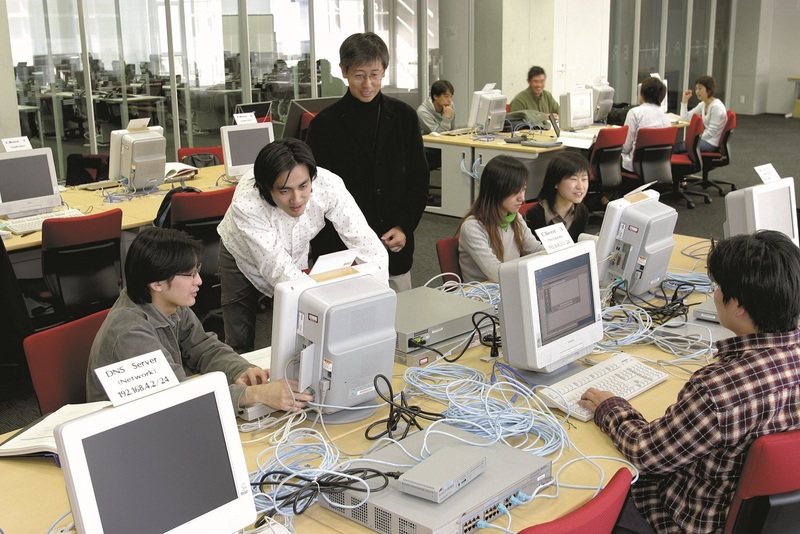 The Information Architecture Laboratory, where you can experience information technology yourself. Covering all essential domains for productive activity from development to materials, assembly/manufacture, measurement, control, diagnosis, logistics, and management. Training researchers and highly skilled engineers to meet the challenges of a globalized manufacturing industry in Asia and the world. Education and research with full coverage of both software and hardware in a practical ambiance. The engineering training room of the production system field contain most of the equipment found in general factories, such as industrial robots, sequence controllers, plant simulators, deterioration diagnosis devices, and remote management devices. 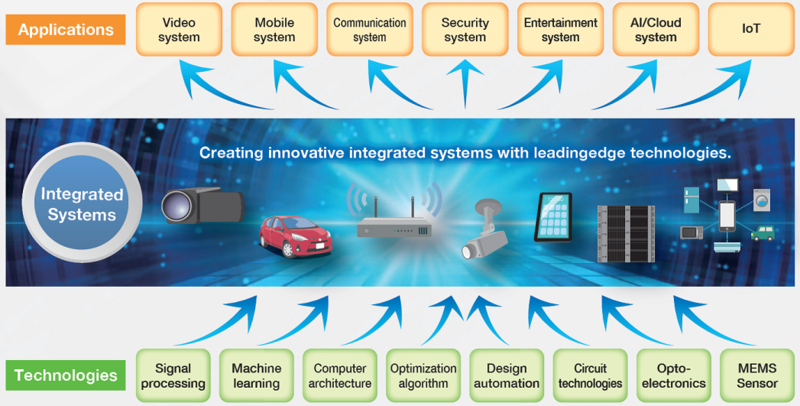 Creating innovative integrated systems with leading-dege technologies. Our field covers wide range study of integrated system applications and their fundamental technologies. Faculty members mostly from top-level corporations conduct practical research and education under strong relation with industries. Fine research environment is provided based on public and industrial research funds by collaborative projects for future IT society. Trial Design for Communication, Video-processing, etc. Joint research with Companies or Organizations of Electronics, Communication, Semiconductor, Automobile, etc. 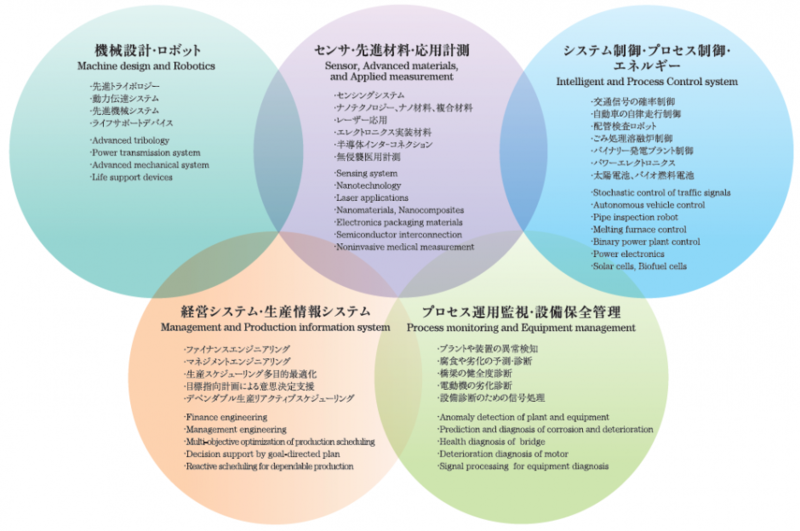 Research collaboration with top-grade universities and academic associations inside and outside Japan.